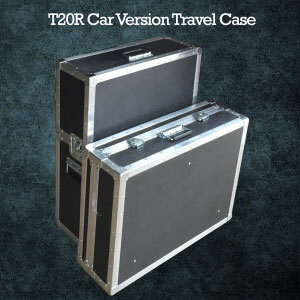 The T20 Traveling Case car version is the most portable and the lightest way to travel for your rental business. The top portion of the T20 can be stored in the trunk of your sedan and the bottom portion can be stored in the back seat or vice versa. Actual Size of the top case: 25 1/2? X 12 1/4? X 31? tall. – Note: This top head is design to fit uprgight position. Actual Size of the Bottom case: 29? X 8 1/2? X 21?